Integrated Packaging Corporation operates at the highest level of quality and efficiency. 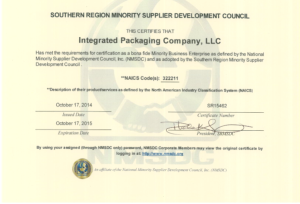 We are a fully certified Minority Business Enterprise. IPC shares our MBE certificates with anyone who wishes to download and save it for their records.